The King is Back! Meet the Elvis Presley Shield Bug - 2NGAW! What would you feel if you were in an expedition somewhere in the forest and found a person’s face staring back at you from the back of a bug? Well, considering that the bug is small, I just might not freak out – but if it was the same one pictured by amateur photographer Winston Jansen, I just might be awestruck that I’d catch it and bring it home! Winston was trekking in the forests of western Singapore when he found this stunning creature with bright colors whose back, when viewed with its head located south, bears a striking likeness to the “King of Rock and Roll”, Elvis Presley. According to Winston, the stink bug really caught his eyes not just because of its brilliant colors but because he knew the markings on its back actually camouflaged with its colorful surroundings in the forest. The colors had been the first he noticed but closer inspection allowed him to see the “face” on the back and he just had to laugh upon realizing it looks like Elvis. This had me wondering how on Earth the bugs were able to mimic Elvis. LOL. Winston admitted he had seen plenty of insects and bugs during that expedition yet it was this stink bug that really caught his attention. 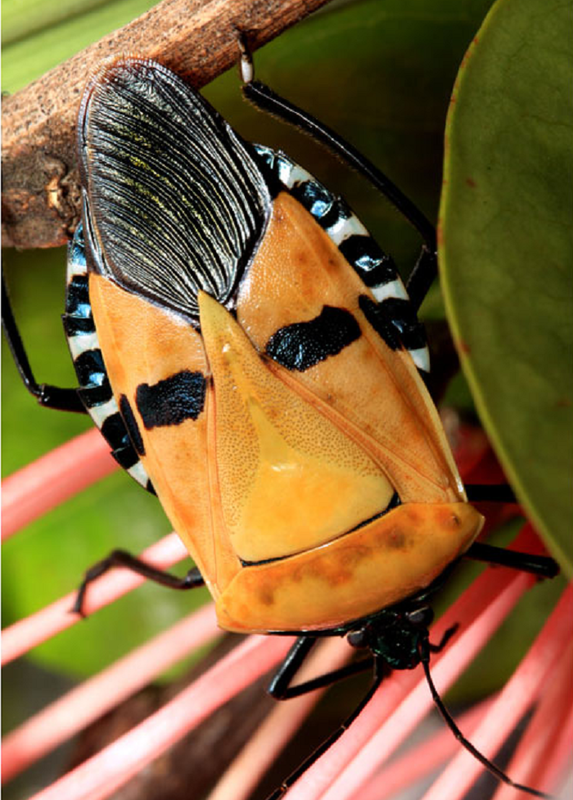 He was not, however, the only person to have seen the Elvis Presley shield bug (the Pentatomoidea bug) as Photographer Darlyne Murawski had also spotted one in the Khao Chong Forest Reserve in southern Thailand during a photographic assignment with National Geographic.